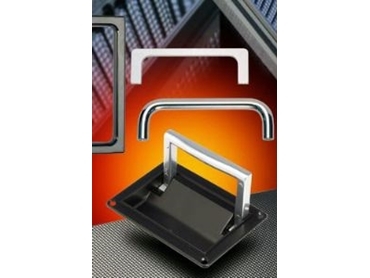 Many different styles of handles are available from Hammond Electronics. HAMMOND Electronics provides a comprehensive range of handles, primarily designed for use on enclosures, subracks and chassis used in the electronic, networking, broadcasting and electrical markets. More than sixty different sizes of handles are available in five different types - steel bar, die cast aluminium, Nylon, lift up and extruded. The bar and extruded handles are designed for use with panels or subracks from 1U to 8U high, while the heavy duty lift up designs are rated at up to 150kg per pair. Each family has a particular combination of strength and aesthetics, ensuring users can match their load-carrying and functional requirements of the handle with a pleasing overall design. Most of the handles are fabricated from aluminium for lightness and strength, clear or black anodised for a long-lasting finish, or from chrome plated steel for more robust requirements. All styles of handle have pleasing lines that will complement any modern enclosure or panel.